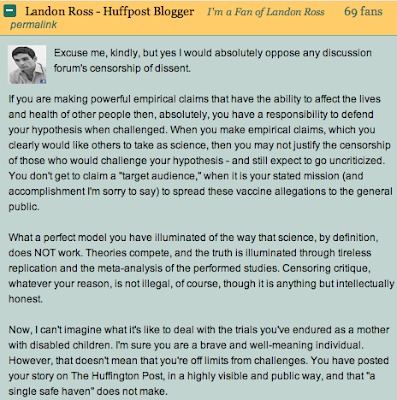 Yesterday I posted responses to two highly visible articles (1, 2) on the Huffington post that were supportive of the fraudulent Andrew Wakefield. Wakefield, if you haven't been following the story, has been found guilty of unethical misconduct, dishonest in his research, and may have faked data in the paper which became the detonator of the anti-vaccine movement (the paper that suggested a link between the MMR vaccine and autism). I felt it would be an auspicious time to convince some more people that they had been misled about the link, since the Lancet retracted Wakefield's paper yesterday (in very, very harsh language for a scientific journal). The chorus of justifications, victim playing, and persecution allegations came in defense of a man who conducted experiments on children for no other reason than his own interests (the procedures were not in the children's interest and were in exchange for money)... That really turned me ill. I was launched a series of graphic stories by mothers of children with autism, regarding their suffering and pain - a rather unfair way to argue the issue at hand - in order that I felt uncomfortable responding at all. I would never presume to know their pain; I feel sympathy for their pain, even if it is hard to imagine. But that simply does not afford their hypothesis any more veracity than it would any other empirical claim. It seems that evidence (forget the scientific consensus) means even less to this group than I had already expected. Like arguing with a creationist, their positions are based on matters of faith and emotion. There's just no retort when the argument becomes "I'm right, you're wrong, scientists are conspiring with the pharmaceutical companies to maim children in order to make money, any evidence against the link has been manufactured by the evil corporations, you don't understand the pain we suffer, I'm a mother and a mother knows what happens to her child, la la la la la la, I can't hear you, la la la la la la!" So would you, an avowed atheist, go into a devout Christian site and tell them they are wrong, there is no God, and expect to have your comments posted regularly? Or would those Christians have the right to a single safe haven where they could share their views among each other? We are very clear in our moderation guidelines who is our target audience and the tone of our content. I have to go tuck in my girls now. People forget in the midst of this that I have three very disabled children who will need me forever. Every Mom thinks they want their babies to need them forever. In reality, it's not quite what one had wished for. We'll even include you in our tuck in prayers. Good night, Landon Ross. If you find me harsh - let me stress, as clearly as possible, that this movement is KILLING AND MAIMING CHILDREN FOR LIFE... in fact, the exact accusation they level at their opponents (we who have the evidence on our side). Why did The Lancet finally act? Because the British board that licenses doctors recently concluded that Wakefield had “shown callous disregard” for the children in his study and had “abused his position of trust” in doing his research. In language I have almost never seen from a disciplinary body, the General Medical Council added that Wakefield acted "dishonestly," was "misleading" and "irresponsible" in the way he described the findings of his tiny study about the danger of MMR vaccine in The Lancet.... The language was probably not strong enough. The Wakefield paper killed children and left others deaf and disabled from preventable diseases as their parents, in an effort to avoid autism, left them unvaccinated. Wakefield’s study was both tiny and flawed. Nearly all of his 13 other co-authors eventually bailed out on the article. Still, the press could not resist from spreading the scary news over and over again, even though no one could get the same findings as Wakefield did. And Wakefield himself, supported by a fanatical anti-vaccine lobby that to this day cannot let go of the vaccine-autism connection, continued to spread fear of vaccines right up to the time of his disciplinary hearing. Well that's more like it. Some real knock down media coverage of a dangerous, irrational, and infectious meme that is wreaking needless havoc. Links to some of the content you requested can be found in my posts on the issue, when the text is highlighted blue or gray. Thank you for your comment. "Many of your like-minded peers often feel that their scientific training makes them supremely superior to parents with children that live with the affliction called autism." - In fact, I find nothing of the sort. They might rightly believe they are superior when it comes to analysis of the data, or when rebutting an argument that is, on its face, completely unscientific, but I have never seen my peers act as if they are "supremely superior" as individuals in relation to other individuals. I don't have the expertise to claim there are no environmental factors to autism. What I do have the science to claim is that vaccines are not the cause. They constitute some of the safest medical advances made to date.